Accommodation in Franschhoek: Dieu Donne Guest Farm. 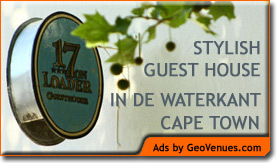 You are here: Home / Western Cape / Franschhoek / Accommodation in Franschhoek: Dieu Donne Guest Farm. Dieu Donné Guest Farm – dating back to 1855 – is a delightful haven of peace and tranquility in the most beautiful valley in South Africa: the picturesque and world renowned wine producing enclave of Franschhoek. We operate a small and intimate family run guest house where personal attention to our clients and their needs are of utmost importance. We pride ourselves on warm welcomes and personal service – we do it all with country hospitality rivaled nowhere. We are just four minutes from the historic Franschhoek village, flanked by the sensational Huguenot and Franschhoek mountains. Excite your visual senses by the sheer breathtaking power and glory of the mountains in front of us. Los Olivos at the Yard.